Investment into renewable energy projects in Australia has dropped by 70% in the last year, according to a new report by a climate change body. The Climate Council says foreign investors are going to other countries because Australia's government has no clear renewable energy policy. Australia has gone from "leader to laggard" in energy projects, it added. Another new report says Australia will need to raise its carbon emission reduction target to 40% by 2025. The damning report on the state of renewable energy, entitled Lagging Behind: Australia and the Global Response to Climate Change, said the country was losing out on valuable business. Investment that could be coming to Australia was going overseas "to countries that are moving to a renewables energy future", said Tim Flannery, one of the report's authors. He said most countries around the world had accelerated action on climate change in the last five years because the consequences had become more and more clear. The report found China had retired 77 gigawatts of coal power stations between 2006 and 2010 and aimed to retire a further 20GW by next year. It also said the US was "rapidly exploiting the global shift to renewable energy" by introducing a range of incentives and initiatives to investors. The future of Australia's renewable energy industry remains highly uncertain, the report concluded, because of a lack of clear federal government renewable energy policy. "Consequently investment in renewable energy in 2014 has dropped by 70% compared with the previous year," it said. The second new report, by the Climate Institute, calls on Australia's government to announce an "independent, transparent" process for setting the post 2020 carbon emission reduction targets. Erwin Jackson, deputy chief executive of the climate body, said too much of the political debate had "ignored growing scientific, investment and international realities". "This short-term focus is simply a high risk approach to the significant challenges of decarbonising our economy and helping avoid dangerous impacts for Australia," he said. Prime Minister Tony Abbott is under pressure to cut the country's emissions much further than the government has planned after the European Union moved to set a new target of 40% by 2030. 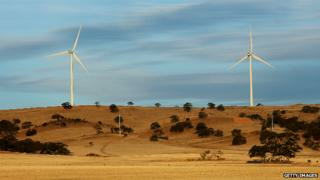 The EU said the agreement, which includes a 27% target for renewable energy by 2030, should set a new global standard. Mr Abbott's government has said it will discuss a post-2020 target early next year and it is likely to come under more pressure this weekend at the G20 summit, which is being held in Brisbane.